VANCOUVER, April 16, 2019 /CNW/ - Goldplay Exploration Ltd. (TSXV: GPLY, FRANKFURT: GPE, OTCQB: GLYXF) ("Goldplay" or the "Company") is pleased to announce that as a result of its ongoing surface exploration at the San Marcial Project, initial channel samples indicate a new gold (Au) discovery the Nava Target. The new gold discovery is located approximately 1.5 kilometres to the west of the San Marcial silver NI 43 101 resource (see News Release dated 7 February 2019), within an area currently showing an extensive hydrothermal altered zone, 500 meters long x 100 m wide, hosting low sulphidation intensive quartz veining and stockwork mineralization.. 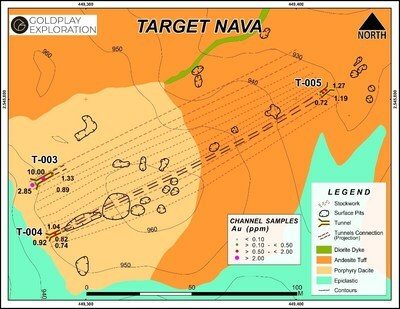 Recent and historical artisanal tunnels in the Nava Zone were channel sampled by Goldplay, with assay results up to 10 grams per tonne (g/t) Au received from a set of sub-parallel quartz low sulphidation epithermal veins. Visible gold has been observed in panned quartz vein samples from some of the channel samples in the Nava Zone (Figure 1). 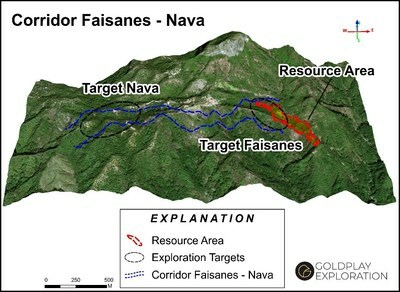 The Nava Zone is one of the priority targets that was identified by Goldplay earlier this year (see News Release dated 18 January 2019) and is located at the western extent of the Faisanes-Nava structural trend ("Faisanes – Nava Corridor") which leads from the San Marcial silver resource (Figure 2). The Nava Zone consists of a prominent hill with historical artisanal workings, including numerous shallow pits. In addition to the pits, three old tunnels, that follow a series of sub parallel NE-SW trending quartz veins, were re-opened (Figure 3). Two of the tunnels have been worked recently by artisanal miners, extracting gold-rich quartz vein material. These two of the tunnels are on the west side of the hill (T-003 and T-004), located approximately 30 m apart, with evidence of not only quartz veining but also stockwork systems between them. The third tunnel (T-005) is on the east side of the hill approximately 160 m away, along the NE strike of the veins, with evidence of connection with T-004. Shallow pits are scattered in the area between the tunnels, demonstrating potential for definition of wide mineralized zones on surface. Goldplay President and CEO Marcio Fonseca commented, "Over the past months Goldplay has actively explored the 1,250 ha of the San Marcial concession with soil, rock chip and channel sampling, identifying and testing targets that will add value to the San Marcial silver resource, by expanding or discovering new mineralized zones. High grade gold results with visible (panned) gold from epithermal quartz veins within artisanal tunnels in the Nava Zone provide encouragement for a gold mineralized low sulphidation epithermal system, just 1.5 km west of the high-grade hydrothermal breccia-hosted silver resource. The new Nava Zone gold discovery suggests that the San Marcial Project has potential to be a significant multi-commodity play, with proven occurrence of gold and silver mineralization together with series of old artisanal mine workings on the Faisanes – Nava Corridor. We are focused on additional sampling and trenching at Nava to define the extent and geometry of the gold mineralization, on surface, and identify targets to follow up with drilling." The Nava Zone consists of a set of NE trending mineralized quartz veins, as well as a recently discovered new zone of intense stockwork and associated alteration located approximately 300m to the west (Figure 3). The veins are interpreted to be in a low sulphidation regime and hosted within a porphyritic dacite and an andesitic tuff unit, in proximity to the contact with an underlying epiclastic volcanic package (Figure 4). The Nava Zone has no previous drilling. 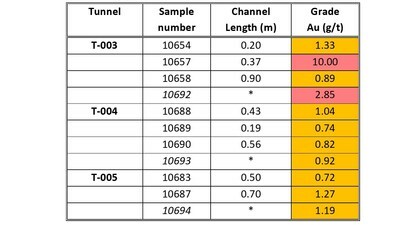 Results range from 1.04 g/t up to 10.0 g/t Au from channel sampling across quartz vein material in the tunnels (Table 1 and Figure 4). Channel samples from the Nava tunnels were collected with a rock saw, typically perpendicular to the strike of the major structures/veins being tested. 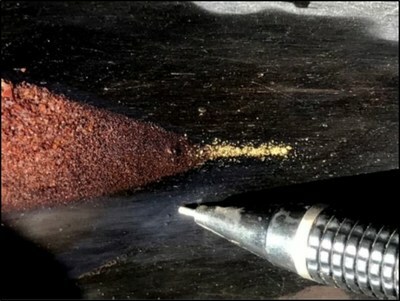 The samples were sent to the SGS de México, S.A. de C.V laboratory facilities in Durango, Mexico where they were analyzed for gold using fire assay, and multi-elements (including silver) using ICP. Results from the other elements analyzed in the laboratory process are currently being reviewed. The Company has placed a high priority on exploration activities in the Nava Zone following this recent new gold discovery. Current exploration activities include surface trenching to expose the mineralized veins as well as local quartz stockwork material (Figure 5), particularly in the main hill area in between trenches T-003 and T-004 on the west, and T-005 on the east side. This area has numerous historical surface pits. Geological mapping and additional channel sampling will be carried out to also test for extensions of the mineralization along strike to the NE and SW. This current exploration also includes the stockwork zone located 300m to the west of the tunnels (Figure 3). 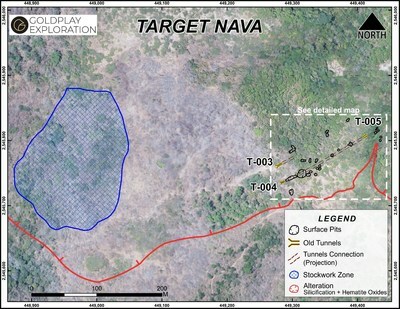 It is anticipated that the current activities will lead to definition of drill targets to test the depth continuity of the gold mineralization at Nava. The Company continues to advance surface exploration at other targets on the San Marcial Project as identified by soil and rock sampling (News Release dated 18 January 2019). These targets, including Faisanes, are yet to be drilled and are located in the vicinity of the NI 43 101 Mineral Resource. Goldplay has already received drilling permits to advance a significant drilling program in 2019. The scientific and technical data contained in this news release related to the San Marcial Project was reviewed and/or prepared under the supervision of Marcio Fonseca, P.Geo., a non-independent qualified person to Goldplay Exploration Ltd. who is responsible to ensure that the geological information contained in this news release is accurate and who acts as "qualified person" under the National Instrument 43-101 Standards of Disclosure of Mineral Projects. Goldplay has implemented QA/QC procedures which include insertion of blank and standard samples in all sample lots sent to SGS de México, S.A. de C.V laboratory facilities in Durango, Mexico, for sample preparation and assaying. For every sample with results above Ag >100 ppm (over limits), these samples are submitted directly by SGS de Mexico to SGS Canada Inc at Burnaby, BC. Goldplay owns a >250 sq. km exploration portfolio in the historical Rosario Au-Ag Mining District, Sinaloa, Mexico. Goldplay's current exploration focus includes surface exploration and drilling, to expand resources at the San Marcial Project, as well as a follow up exploration program at the El Habal Project. The San Marcial land package consists of 1,250 ha, located south of the La Rastra and Plomosas historical mines and 20 km from the Company's 100% owned El Habal Project in the Rosario Mining District, Sinaloa, Mexico. San Marcial is an attractive, near-surface high-grade silver, lead and zinc project for which a NI 43-101 resource estimate was completed by Goldplay in early 2019. The El Habal Project is a drilling stage project. The oxidized gold mineralized zone outcrops along a series of rolling hills with evidence of historical shallow underground mining along a 6 km long prospective corridor. The El Habal Project is located near the historical gold-silver Rosario Mine which reportedly operated for over 250 years. Goldplay's team has over 30 years of experience with senior roles in exploration, financing, and development in the mining industry, including over ten years of extensive exploration experience in the Rosario Mining District, leading to previous successful discoveries. A current NI 43-101 report on the El Habal Project is filed on SEDAR. This press release contains forward-looking statements and information that are based on the beliefs of management and reflect the Company's current expectations. When used in this press release, the words "estimate", "project", "belief", "anticipate", "intend", "expect", "plan", "predict", "may" or "should" and the negative of these words or such variations thereon or comparable terminology are intended to identify forward-looking statements and information. Such statements and information reflect the current view of the Company. Risks and uncertainties may cause actual results to differ materially from those contemplated in those forward-looking statements and information. By their nature, forward-looking statements involve known and unknown risks, uncertainties and other factors which may cause our actual results, performance or achievements, or other future events, to be materially different from any future results, performance or achievements expressed or implied by such forward-looking statements.